Having spent a fair amount of time in the saddle, I decided to document what does, and does not, work for me. Disclaimer – I am still only riding LDs, so I can’t ensure what works for me now will still work as I move up to longer distances. But I am sure if it doesn’t work for 25 miles, it won’t work for 50! 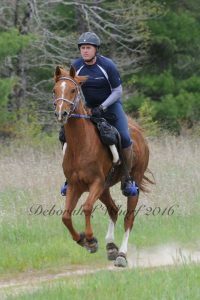 Since getting into endurance last year, I have constantly been trying to figure out what is the most comfortable riding attire for me. Let’s start with I am an English rider. I ride in a Bates all-purpose saddle. I do put Easy Ride stirrups on for rides over about 10 miles and ride with Ariat Terrains and half chaps. I’m not thrilled with the Terrains because they have stretched out (like every other pair of Ariats I own). Eventually, I will replace them with Merrell or some other high-end hiking boot with a smooth sole. As for the half chaps, I have the Ariat Terrain Half Chaps. They are fine for now. I won’t spend the money to replace them until they are damaged or worn out, but I will likely try a different brand that has some ventilation for the outside of my leg. Having spent plenty of time in standard breeches, I knew those were not what I wanted to wear for long periods of time. Last year, I bought a pair of Rackers tights. I also do some triathlons, so I decided to wear my triathlon shorts under the Rackers in order to eliminate cotton underwear. I like the little cell phone pocket on the leg of the tights. They fit nicely and have belt loops which makes it easy to tuck in a shirt and keep it there. However, the tri shorts underneath doesn’t really work. The bottom edge of the shorts ends up right where my thigh contacts the saddle and rubs about a couple of hours of riding. I finally ordered a pair of Saddlebums Racing Tights and today was my first ride in them. We went 16 miles and I was in the saddle for 3 hours. My first impression was the material is very similar between the Rackers and Saddlebums. The Saddlebums do not have belt loops and the cut of the waist made me feel like I would have plumber’s crack every time I bent over and probably in the saddle too. With the Rackers, I had tried riding in a cycling jersey, but it was uncomfortable with the belt on. So before heading out this morning, I changed out of my shirt and into a cycling jersey. Since the cycling jersey has an elastic waist and comes down lower in the back, it solved my problem! The Saddlebums also have an integrated chamois pad, so they are designed to wear without underwear. As a guy who has spent time in bike shorts and tri shorts, it feels quite normal to me. I put the amount of padding much closer to tri shorts than bike shorts. The optional pocket on the Saddlebums is much larger than the Rackers and actually has a velcro top (which I like). Overall, I give the nod to Saddlebums for distance riding and will likely be ordering a second pair. That said, I think my Rackers will become my go-to schooling attire for jumping. I have found that cycling/triathlon tops make great crossover for endurance riding. I have a Pearl Izumi cycling jacket that is my go-to rain top for horses. It is very compact and fits in my cantel bag with all my other stuff. If you are looking for solutions for men’s attire, check out a local bike shop!